Families in Plymouth will benefit from free foraging courses thanks to investment delivered by Soup, the crowdfunding business event from GAIN at Plymouth University on 10 May. Social enterprise The Family Foraging Kitchen won against three other investment-hungry businesses at the event, which was sponsored by Francis Clark. The investment secured through Soup will enable The Family Foraging Kitchen to run a series of free events to teach low income families in Plymouth how to collect and cook with free, wild food. Based in Millbrook, South East Cornwall, the company offers foraging events and courses for corporate teams, schools, colleges and individuals. The Family Foraging Kitchen founder Vix Hill-Ryder went up against three other female entrepreneurs. Each presented a four-minute pitch to an audience of 70, who watched the presentations over a bowl of soup, before voting for their favourite with their spoons. 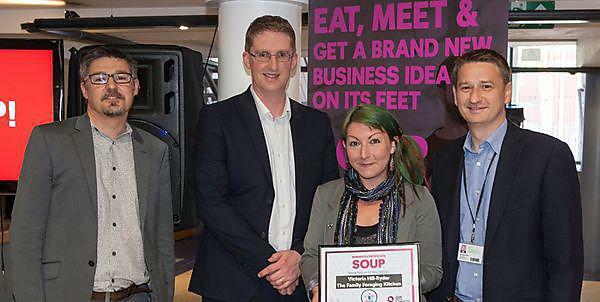 Vix won £750 for her venture, from the event takings and supplemented by GAIN at Plymouth University. As well as the £750 investment Vix has secured a blog on GAIN’s digital exchange, gaininbusiness.com, and will be eligible for a range of support from the University. Cornish Soapcakes: Liskeard-based creator of handmade, natural and simple soaps and skincare products. Band-it Products: a Falmouth company that designs products to help people who are visually impaired to be more independent at home. If Everyone Cares: a CIC based in Bristol and Devon, which recently launched Ododow, The Interactive Community Map to pinpoint UK charities, non-profits and community projects.